You can make 100 varieties of banana muffins, our this month's Gayathri"s Baking Eggless challenge was banana muffins.Obviously i was quite happy when she announced to make some eggless banana muffins. Eventhough my space have variety of eggless bakes and definitely banana muffins are one among those i wanted to make something different. So this time i went for a eggless, sugarless,butterless,whole wheat and walnut banana muffins but not vegan as i used yogurt in this muffins. 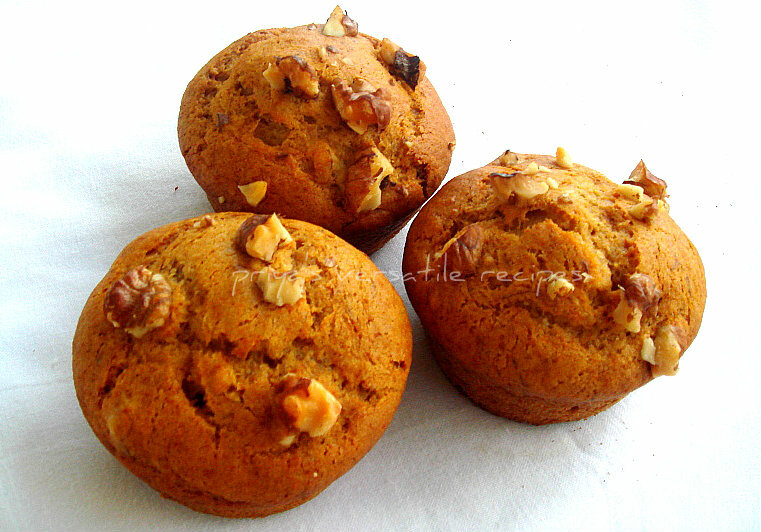 Its quite an easy,attractive,healthy,nutty and fabulous muffins to enjoy anytime of the day.We had this super spongy muffins for our breakfast,as dessert after our lunch and with a cup of coffee for our snacks,while my teddies enjoyed them simply with a glass of milk.My egg substitute for making this muffins is vinegar and baking soda,do try this friends you wont stop yourself having this fantastic muffins.As i used my mini silicon pan, these muffins are ready within 12 minutes.Sending to Amina's Guest Quest. Preheat the oven to 350F, meanwhile sift together the wheat flour with salt, baking powder and baking soda and finally add the chopped walnuts (keep some nuts for the topping), keep aside. In a large bowl, take the mashed bananas,honey,oil,yogurt,apple cider vingar and mix everything well.Fold the dry ingredients to the wet ingredients gently..
Pour enough batter to the already prepared muffin pan or a silicon muffin pan.Springle few chopped walnuts on the top. Bake to 12-15minutes until a skewer inserted comes out clean. Its been a while i hosted food related events, finally am here with an event 'Microwave Easy Cooking' well known as MEC was initially started by Srivalli. Thanks to Srivalli for giving me this opportunity. Am damn sure that many of my blogger friends will come up with their delicious microwave entries.If you are using your microwave oven just for reheating rice or gravies, its time for you to give a try to cook different dishes.You can cook any kind of dishes using microwave oven, since i got a microwave oven at home my life became easier as am using it almost once a while to prepare a complete meal with it.You can make a simple omelette to baking cakes through them. Calling all food lovers to cook up dishes using microwave oven, to participate in this event. We dont have any themes for this event, you can cook any sort of dishes from appetiziers to desserts using microwave oven. 1. Cook Any Dish for the event. The entire cooking has to be done in the microwave. 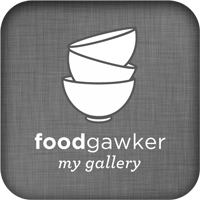 You can use food processor for grinding and the like. But no stove top cooking to be done. Post vegetarian /non Vegetarian recipes for the event. 2. Entries posted from 1st - 30th June 2012 is acceptable. 4. Please use the event logo and its not compulsory. Your entry post should contain the link to the event announcement and Srivalli's MEC Announcement.Its mandatory. Looking forward your creative and delicious entries. 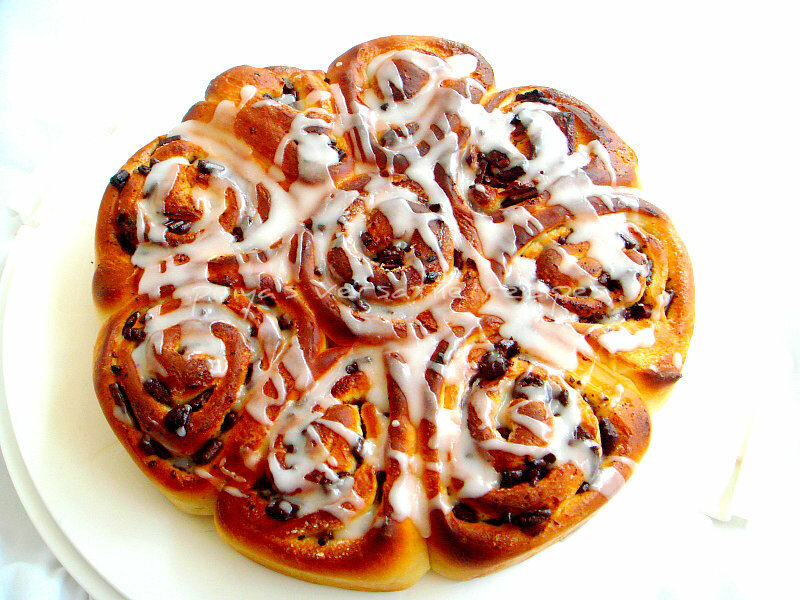 Most of my dishes i have posted in my space comes true coz of my curiousity,its happens quite often and one of my recent creation was this eggless chocolate chips cinnamon rolls. Since a long i want to combine my two favourite ingredients chocolate and cinnamon together in rolls,finally it happened yesterday. I tried this wonderful looking rolls yesterday and they came out absolutely fabulous. This rolls went for generous amount of chocolate chips,cinnamon powder and definitely with less butter, these rolls are quite addictive and very attractive. These yummy incredible rolls suits prefect to have for snacks with a cup of coffee or tea, just imagine this rolls with coffee super tempting na. These rolls vanished quickly and i have to hide some rolls for H as they were quite addictive. Yep, my kids were literally behind these rolls and they couldnt stop themselves having this chocolate rich rolls. Even my H who dont like cinnamon flavour in bakes simply loved it. 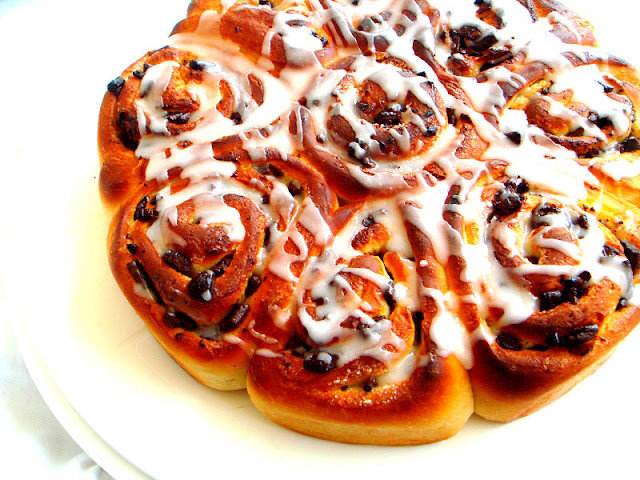 Am gonna make quite often this chocolate filled cinnamon rolls.Dunno whether you guys are like me, i can even have this irresistible rolls even for my breakfast.Sending to Amina's Guest Quest. Take the all purpose flour and melted butter in an another large bowl...gradually add the foamy yeast to the flour and knead as dough. Once the dough doubled their volume, springle few flour and knead again for few minutes, flatten the dough with a rolling pin. Slice the dough as 8-9 thick slices.Arrange those slices over a greased round baking mould..cover it with a plastic wrap and let it sit again for an hour until they double their volume. Preheat the oven to 350F..arrange the baking pan in the middle rack and bake the uncooked rolls for 20-25minutes until its turn golden brown..let them cool.. Mix the confectioners sugar with few drops of water as thick paste, drizzle over the rolls before serving. 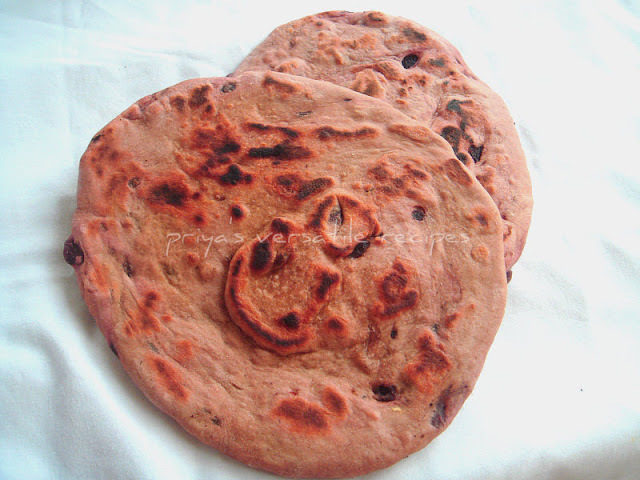 Everyone at home like chappathis, simple rotis to stuffed parathas watever my teddies love it very much.Few days back i prepared this super healthy rotis with garam masala powder and flaxseed meal. With a wonderful masala flavour this chappathis tastes simply awesome when served along with quick tomato chutney. Its a healthy,nutritious,flavourful,soft and definitely a filling chappathi to enjoy either for breakfast or for dinner. A prefect chappathis even if you are dieting, you doesnt need any side dish to have with them.You can even freeze them for later use and they will stay prefect.This will be definitely handy when you are in hurry.You can also prepare this chappathis without oil,just by cooking them in a non stick pan.You can make frankies or kothu chappathis with this healthy chappathis, yep you have numerous choice to enjoy this simple rotis.Sending to my own event Healthy Diet-Breakfast guest hosted by Roshni. Take the wheat flour,flaxseed meal,garam masala powder with salt in a large bowl,gradually add the water and knead as smooth and soft dough. Keep aside half an hour, make medium sized balls from the dough,dust with flour and roll them as rotis..Meanwhile heat a tawa, drop gently the rolled roti,drizzle few drops of oil,cook on both sides until they gets well cooked. Today is our last day of blogging marathon, hope i didnt bored you all with my non stop peanut recipes,this brittle is my last post for this week of blogging marathon as i choosed peanuts as main ingredient..Check out the other marathoners running this 16th edition of blogging marathon with me here.When we were kids, my mom used to make quite often chikkis with peanuts for our snacks.She used to make big batch and we used to munch them for many days. Obviously those yummy peanut treats are my most favourite when i was kid.Few days back,my mom send me a parcel from India with a huge packet of raw peanuts and cashews, my sweet tooth started craving for those aromatic and crunchy munchy treats. 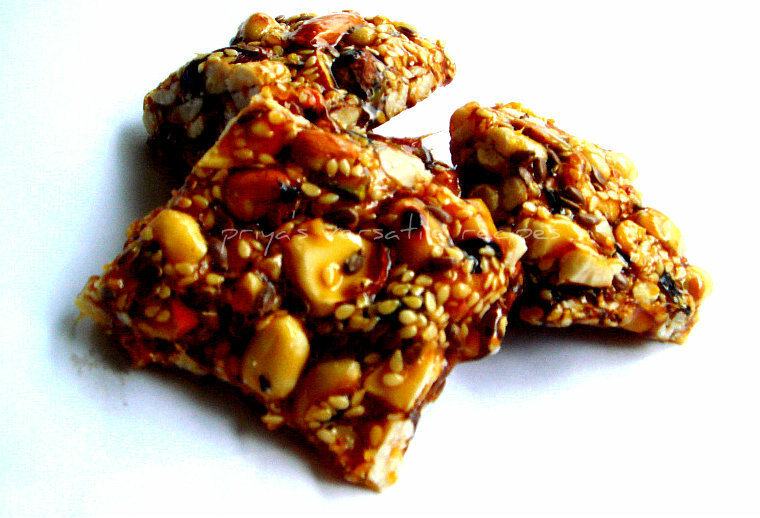 Without any hesitation,i prepared a mixed nuts and seeds brittle with roasted nuts like peanuts, almonds,pistachios,cashews and with mixed seeds like flax seeds,sesame seeds and few sunflower seeds.Needless to say these chikkis are quite addictive and we couldnt stop munching these addictive beauties.These chikkis get vanished very much quickly once they get cooled.Sending to Show Me Your Hits - Iron Rich Foods hosted by Julie,event by Sangee &to Amina's Guest Quest. .
Roast the peanuts in a pan and remove the skins and keep aside.In the same pan, dry roast the almonds,cashews,pistachios one by one until a nice aroma comes out. Heat 1/4cup of water in a heavy bottomed vessel, add the jaggery...heat it in medium flame until the jaggery get well dissolved.Strain the jaggery water with a strainer, this helps to get rid of the mud and other impurities presents in the jaggery. Heat now in high flame, they will start bubbling vigorously.Stir them continously, once they turn thick, just put a drop of the jaggery in cold water and roll them, if you are able to roll them. Add the roasted peanuts,almonds,cashews,pistachios,sesame seeds,flax seeds,sunflower seeds and cardamom powder and salt to the jaggery syrup.Stir well until its turns thick. Grease a plate,pour this mixture and let them cool completely. 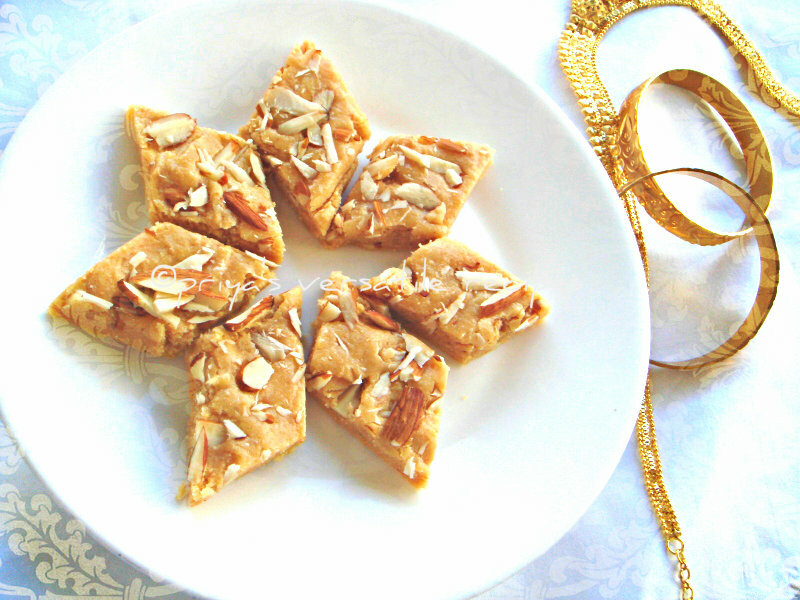 Cut this brittle as you desire and conserve them in an air tightened box and enjoy. Since ever i brought mini idli plates from India, i can feed easily anytime my family with it. We all love mini idlis as anything,nowadays am not breaking my head whenever i run out of ideas for making my dinner or breakfast. 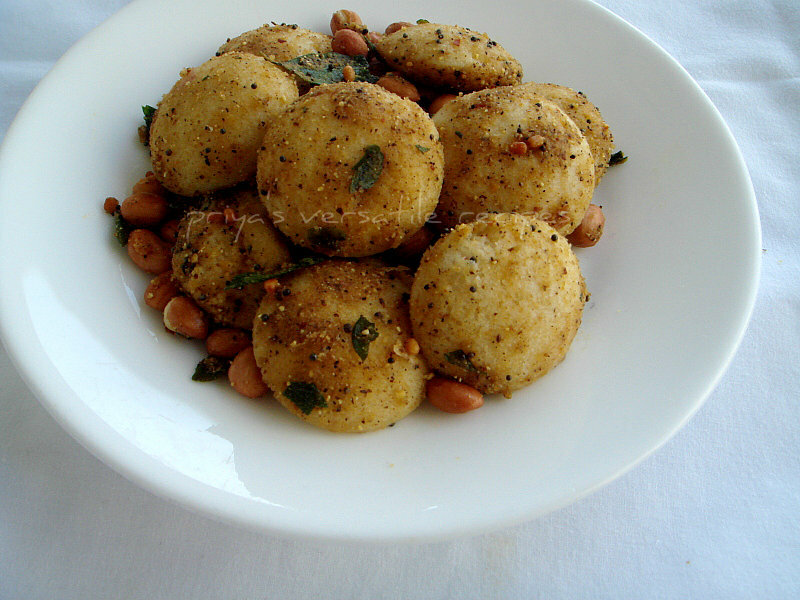 I'll just make some mini idlis and spice it quickly either with milagai podi or with any other spice powder from my pantry.Mini idlis with spice powders goes for easy breezy preparation as always. Recently i prepared my favourite Peanut coconut podi, i used this super flavourful spice podi for spicing my mini idlis for our dinner yesterday. 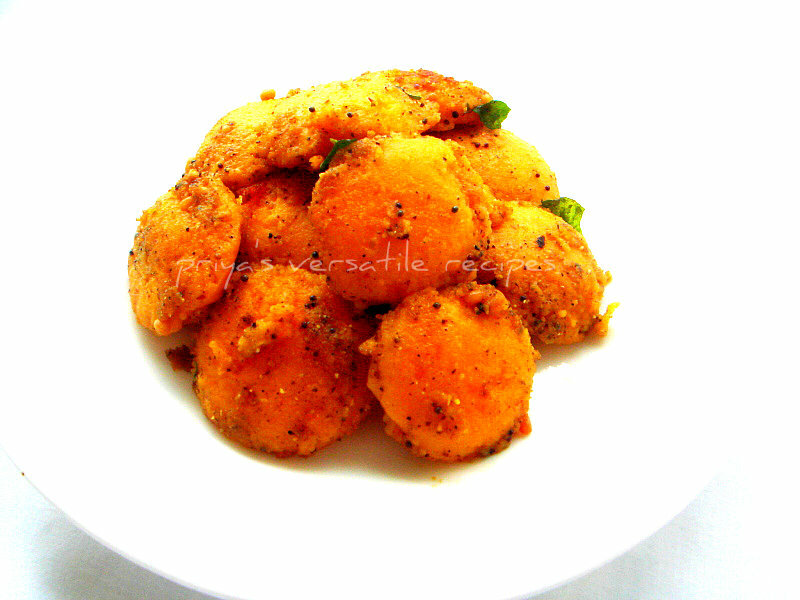 We just loved it and this super flavourful spiced mini idlis vanished very quickly once i served it to everyone. I couldnt stop myself adding some peanuts while tempering, this addition of peanuts turned this yummy mini idlis more nutty and tasty.Check out the other marathoners running this 16th edition of blogging marathon with me here.Sending to Healthy Food for Healthy Kids - Toddlers Lunch guest hosted by Priya,event by Nithu,Healthy Diet-Breakfast guest hosted by Roshni and Show Me Your Hits - Iron Rich Foods hosted by Julie,event by Sangee..
Heat oil in a pan,let splutters the mustard seeds,urad dal and curry leaves..add the raw peanuts and fry for few minutes,now add the mini idlis,toss gently for few seconds..
Add the peanut coconut podi, toss again gently for few minutes and serve hot..
Needless to say how it will be lazy to cook when its super hot outside. I felt like having something quick as soup for my today's lunch, this easy soup goes for variety of veggies. Just picked all the veggies left in my fridge and cooked everything together in low fat cream and vegetable broth in which i could not stop myself adding some orzo pasta and boiled peanuts.This soup was really filling, comforting and hearty with plenty of veggies, its quite an excellent,super filling soup can be prepared within few minutes with simple ingredients that we have anytime at home. This soup with peanuts and orzo can be served even for dinner with some toasted bread slices or grilled meats.I prepared my soup bit thick as i had it for my lunch, you can add more water in case if you need to have them bit light. You can skip very well the cream in this soup,by replacing it with a sauce prepared simply with water and cornflour. Check out the other marathoners running this 16th edition of blogging marathon with me here.Sending to Show Me Your Hits - Iron Rich Foods hosted by Julie,event by Sangee. Add immediately the vegetable broth,pepper powder,salt,dry parsley leaves and enough water,cook everything in medium flame until the veggies gets half cooked..
Add the orzo pasta ,peanuts now to the cooking veggies with low fat cream and put the flame in simmer. 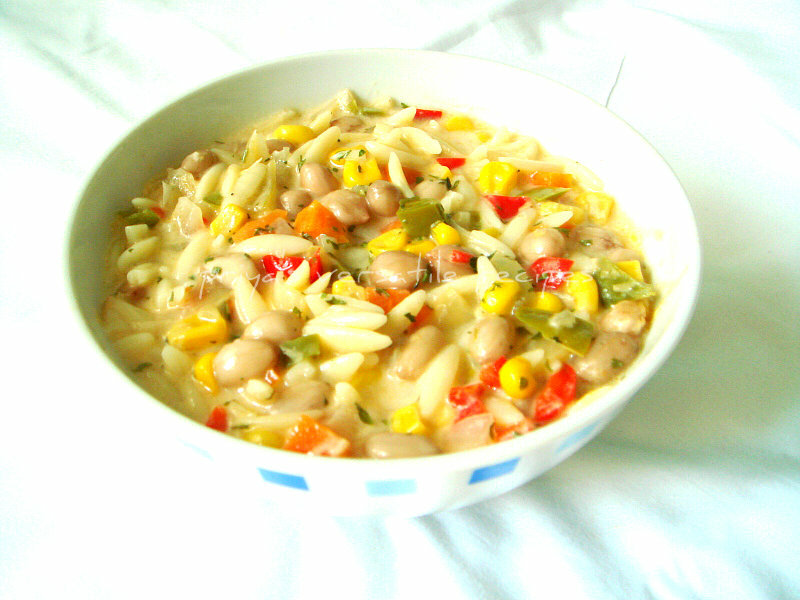 Cook this thick and yummy soup until the veggies gets well cooked. I make salads almost twice or thrice in a week for our dinner.Obviously i do many varieties of salads with many fresh veggies,cooked legumes,nuts and serve them with different dressings.When i choosed peanuts as this week's star ingredient for blogging marathon,i was quite breaking my head for making a simple,quick and easy salad as Valli suggested to make 7 different dishes with salad and soup as one among those dishes with the main ingredient we choosed for a week.Two days back my H came home with a packet of red and green bellpeppers asking me to prepare a quick salad. Immediately i prepared this simple salad with red and green bellpeppers along with boiled peanuts,tomatoes and served with hung curd,mayonnaise,pepper powder and salt with herbs . While serving,i simply served this salad topped with crushed tortilla chips,thanks to Nithya of 4th Sense Cooking for sharing her trick to feed the kids easily the salads topped with chips.For my surprise,even my lil one who never liked peanuts enjoyed having this colourful,delicious and healthy salad.Try adding boiled peanuts next time while preparing salads friends, am sure you guys will definitely love this.Check out the other marathoners running blogging marathon here. Sending to Show Me Your Hits - Iron Rich Foods hosted by Julie,event by Sangee. Take the chopped bellpeppers,chopped tomatoes,boiled peanuts in a vessel, while serving add the hung curd,mayonnaise,pepper powder,dry mixed herbs,salt to the veggies,give a quick stir and serve it immediately topped with crushed tortilla chips..
Have you ever tried making dals with raw peanuts, if not you should give a try to this super comforting,nutty and fingerlicking dal.I never thought of adding raw peanuts in dal until i choosed making food with peanuts for this whole week of blogging marathon,but my guess about this dal wasnt wrong. 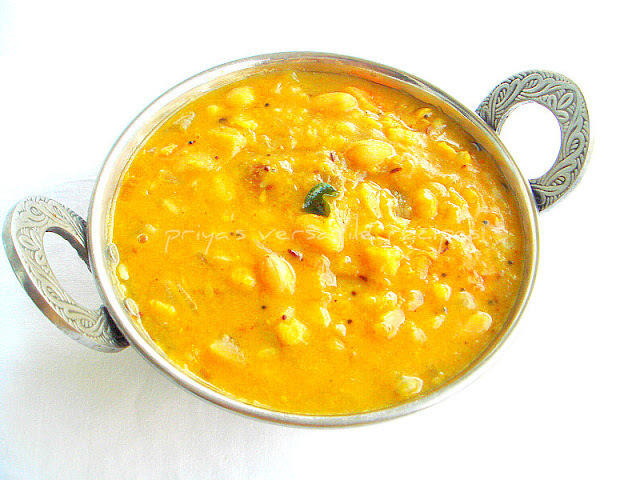 This yummy, super delicious dal tastes absolutely yummy,peanuts gives an incredible texture to this usual dal. As this is my first time am adding peanuts in dal, i dont want making simple dal with those raw peanuts thats y i added few bottlegourd chunks in this fingerlicking dal.You can prepare this dal even if you are in hurry, which tastes absolutely marvellous and comforting.Serve them along with hot steaming rice,some spicy mango pickle and papads nothing will beat this combination.Check out the other marathoners running blogging marathon here. Sending to Show Me Your Hits - Iron Rich Foods hosted by Julie,event by Sangee. Take the washed channadal,moongdal,peanuts, chopped bottlegourd pieces,crushed ginger and slit opened green chillies in a pressure cooker with enough water and turmeric powder and cook upto 3hisses, keep aside and let them cool. Meanwhile heat enough oil, fry the mustard seeds, urad dal, cumin seeds and curry leaves..add the chopped onions,chopped tomatoes and saute until the veggies get cooked. Add the cooked dal mixture with enough salt to the cooking veggies and bring them to boil..finally add the lemon juice and put off the stove.. Sometimes i had to break my head to finish up leftover slices of stale breads, we usually have for breakfast.Seriously i got bored of using those bread slices for making vadas or cutlets, after trying out Bread pakoras for bloghop wednesdays i can feed easily everyone at home those stale bread slices as this kind of no fry bread pakoras. This time for a change i prepared a simple,quick and nutty filling with grated paneer, coarsely grounded roasted peanuts spiced with chilly powder, kasuri methi,cumin powder and salt. 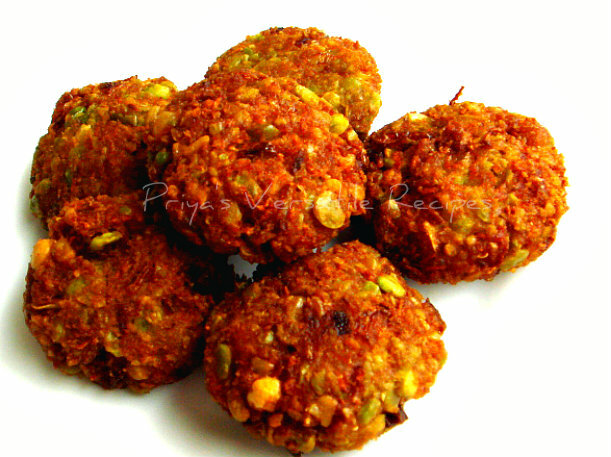 You doesnt need to cook this filling and you can use it directly as stuffing in your bread pakoras. 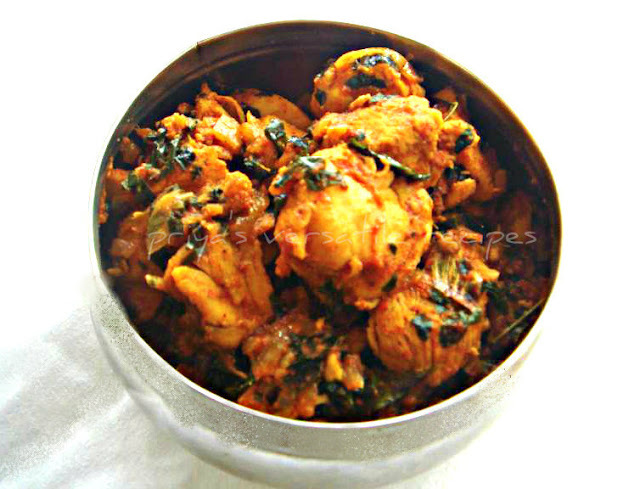 We just loved this yummy pakoras and its our recent family favourite. 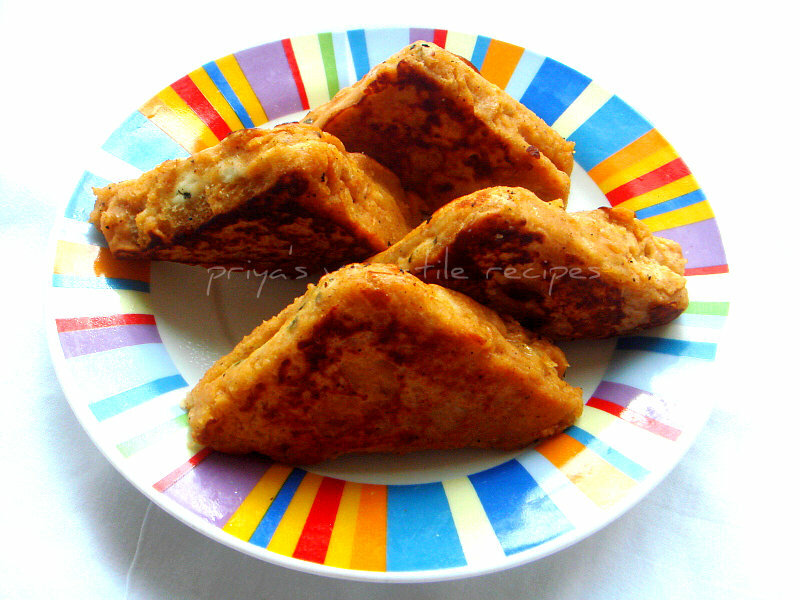 Serve this pan fried bread pakoras with a cup of tea or coffee anytime of the day, am damn sure you will definitely have a super satisfying,delicious and definitely a guilt free snacks. You can even serve this pakoras as a starter for a party menu, you have numerous choice to enjoy this yummy pakoras.Check out the other marathoners running blogging marathon here.Sending to Amina's Guest Quest. Take grated paneer,coarsely grounded peanuts, cumin powder chilly powder, salt and kasuri methi leaves in a bowl, mix everything well and keep aside. 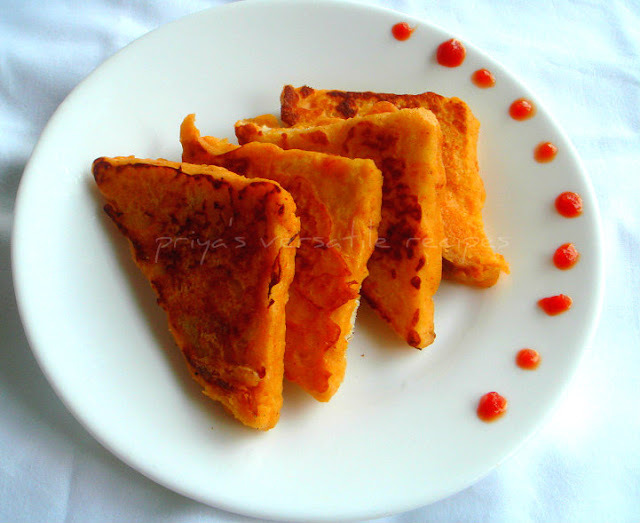 Take the besan flour red chilly powder, salt,yogurt in a bowl,add gradually the water to turn as a mildly thick paste..
Cut the bread slices diagonally and spread already prepared paneer-peanut filling and close it with an another bread slice. 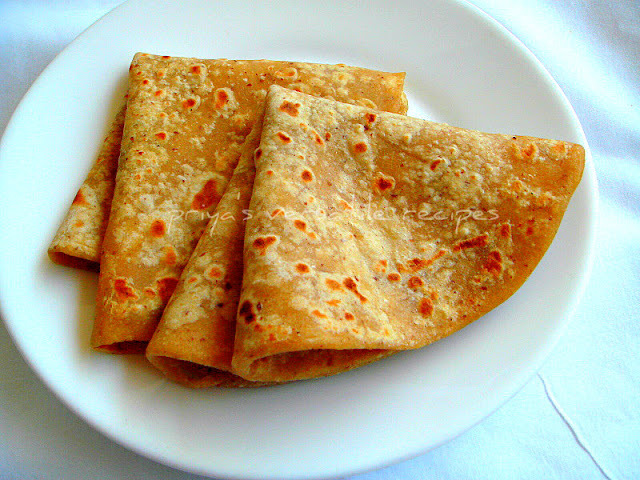 Meanwhile heat enough oil in a tawa,dip this stuffed bread slices to the prepared paste and drop gently to the hot tawa..fry on both sides until they turns golden brown.. Enjoy warm with ketchup or with the chutney of your choice. Here am starting an another week of blogging marathon, as i told earlier this week is gonna be interesting week with definitely delicious foods. For this week of blogging marathon, i choosed 'pick one and cook all' as theme, after a long discussion and hesitation, finally i choosed this week star ingredient 'Peanuts'. So i'll be post foods prepared with peanuts as main ingredients for this whole week.check out the other marathoners running this 16th edition with me here. After i finalized the peanuts as the star ingredient for this second week of blogging marathon, the first food i wanted to prepare with it is this super crispy vadas.I prepared them for our yesterday's lunch, i combined both channa dal and peanuts equally together for making this addictive deep fried beauties. 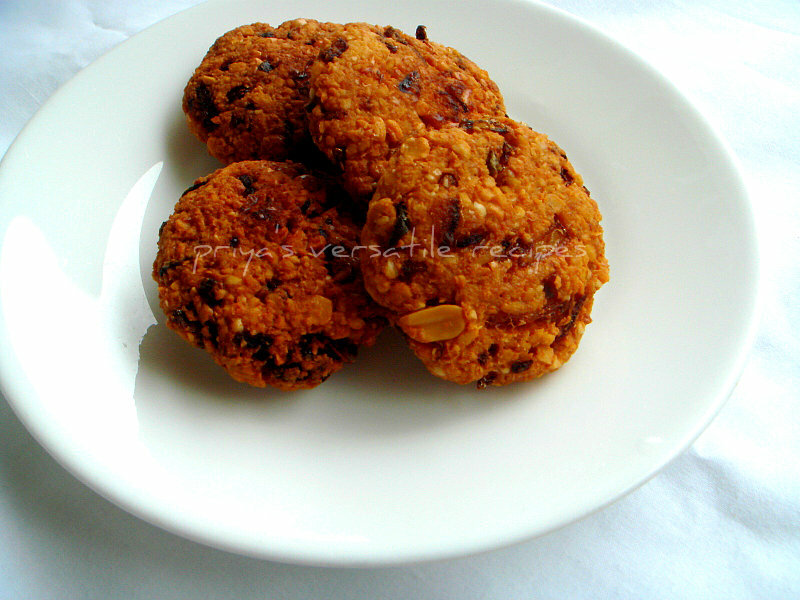 The addition of peanuts gives a fabulous taste to this vadas and goes awesome as side dish for spicy tamarind based gravies, everyone at home simply loved it.Sending to Amina's Guest Quest. Soak together the channadal and raw peanuts for two hours,grind them coarsely without adding water, if its too hard to grind just springle few drops of water. Now add the chopped onions, chopped green chillies, ginger pieces, crushed garlic,chopped curry leaves, coriander leaves, crushed fennel seeds and salt to the grounded batter.. Drain the excess of oil with a paper towel and enjoy. Last week we had a sunny day,its was too hot suddenly and we were quiet happy for seeing the sun god after a long, after that day the climate is getting worst and its raining like anything. 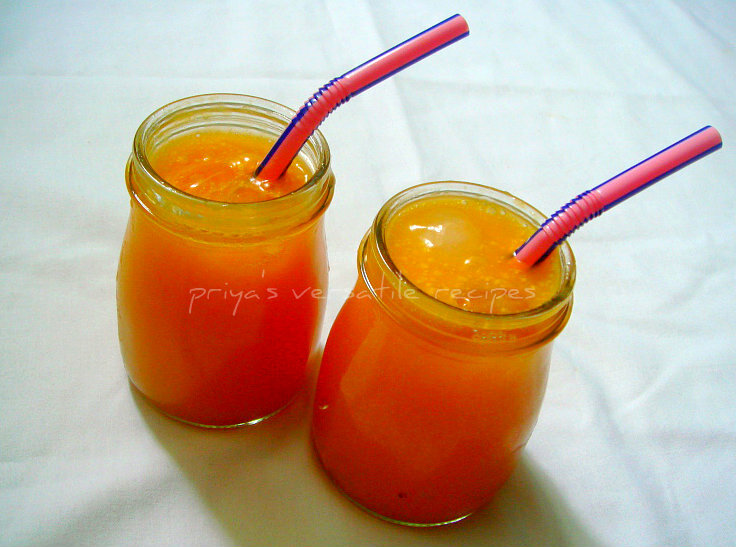 I prepared this super refreshing mango soda with freshly squeezed lemon juice,soda and mango puree to beat the heat on that particular day. The final result was an incredible,super refreshing drink,obviously this drink is definitely a thirsty quencher.A prefect drink to enjoy without any hesitation while its too hot outside. My kids just enjoyed having this drink and even my lil one asked to make quite often this drink,watelse a mom need.This is my final and last post for 'cooking with colour' as theme i choosed for this whole week of blogging marathon,check out the other marathoners running this 16th edition with me here.Sending to Amina's Guest Quest. . Grind the mango cubes as thick puree with enough water and sugar, fill 1/4th of the glass with this mango puree,lemon juice as per your need. Add the soda slowly as per your need and give a stir. (once you add the soda, lemon juice already added while make some bubbles).Serve with ice cubes. I think its been more than a year i prepared my mom's signature sweets coconut and rava burfis.This weekend we had a rainy days and my sweet tooth started craving for some sweets, immediately i wanted to make some coconut burfis. 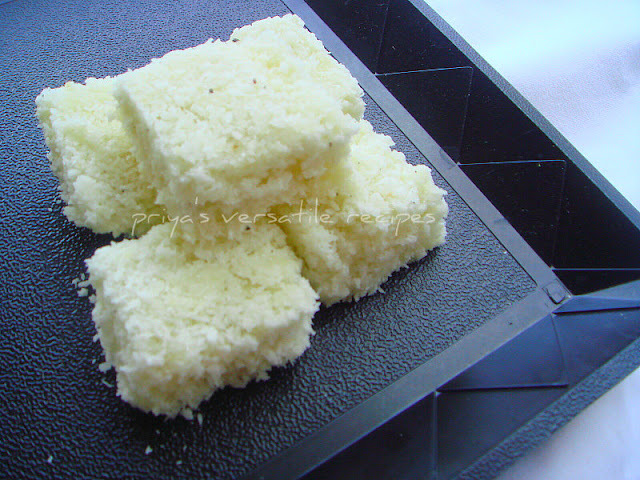 My mom's burfis goes always for some roasted rava along with freshly grated coconut,adding rava will gives a fabulous texture while having this burfis.Other than that this burfi goes for the usual way of preparation. These yummy,addictive and tasty white burfis are my 6th entry for this month's blogging marathon as i choosed cooking with colours as theme,check out other bloggers running this 16th edition of blogging marathon here.Sending to Amina's Guest Quest. Heat the ghee in a heavy bottomed pan, roast the coconut,rava together until a nice aroma comes out.Transfer the roasted rava and coconut to a plate and let them cool. In the same pan, take sugar cover it with enough water and bring it to boil,cook until it reaches one string constitency,add immediately the roasted rava,coconut,cardamom powder and cook in simmer until the mixture gets off the vessel. Pour the burfi to a greased plate and let it cool completely.Slice the burfi as you desire and enjoy. After trying out pumpkin,beets,tomato and chocolate for colouring my dishes, here comes one more catchy and colourful cute looking mini carrot idlis as my theme for this whole week of blogging marathon is 'Cooking with colours'.I have told earlier, that i can feed easily my teddies with mini idlis. This time i prepared a special carrot idli batter with cooked carrot puree and usual idli batter. These cute idlis tastes bit sweet,that why i spiced it simply with pav bhaji masala and idly molagai podi just to mask the bit sweetness of this yummy cute mini idlis.I was bit nervous while serving this idlis as its tastes bit sweet, but for my surprise they just finished the whole plate quickly. An excellent,healthy,attractive and catchy breakfast or dinner to enjoy without any hesitation.Check out other bloggers running this 16th edition of blogging marathon here.Sending to Healthy Food for Healthy Kids - Toddlers Lunch guest hosted by Priya,event by Nithu & my own event Healthy Diet-Breakfast guest hosted by Roshni. Mix the carrot puree to the idly batter.Grease the mini idly plates with oil and pour enough idli batter and steam cook for about 10 minutes in idly cooker, once done remove carefully with a spoon and keep aside. 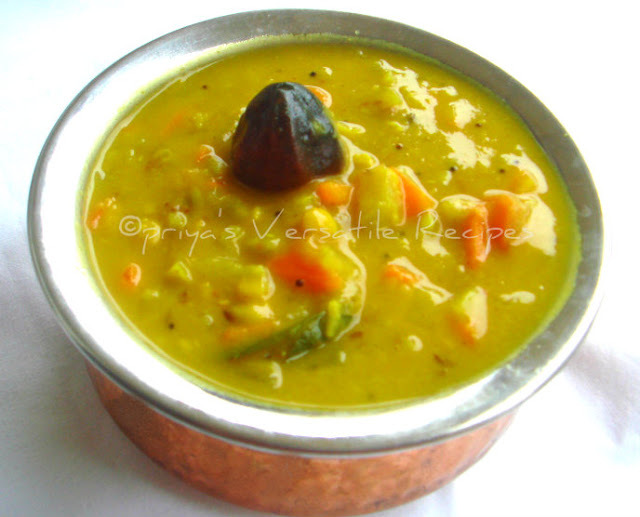 Heat oil in a pan,let splutters the mustard seeds,urad dal,add the curry leaves and mini idlis. Toss gently for few seconds, add the idly milagai podi and pav bhaji masala, toss again gently for few minutes until the idlis gets well coated and serve hot..
Dunno how i missed to post my all time favourite dark chocolate buns till now,these brown buns are truly fantastic. 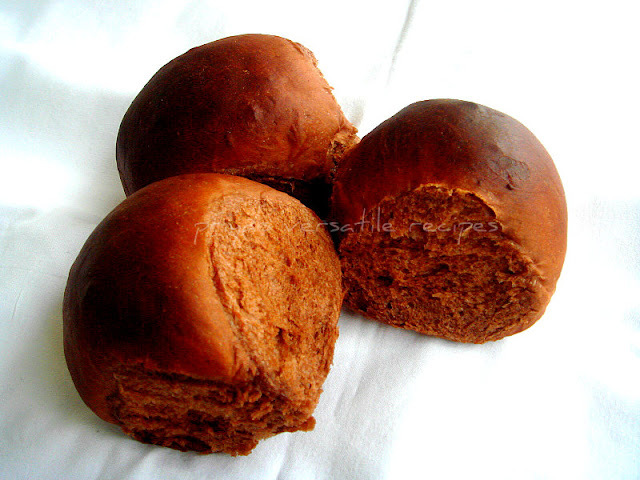 This spongy and soft buns are really very simple to prepare, filling and definitely delicious to enjoy.Just dip this sweet buns in a cup of tea and enjoy it either for breakfast or for snacks, they will tastes absolutely divine.You can also serve them with nutella spread or with fruits jams and butter. This buns stays prefect for three to four days in room temperature and for month if they are freezed in ziplock bags,once they get defrost, just reheat in preheated oven or in microwave oven and enjoy as you desire.Seriously i can bet that none can resist to the aroma of this freshly baked chocolate buns,the aroma comes out of this buns while baking was extremely incredible and filled the whole home.Check out other bloggers running this 16th edition of blogging marathon here.Sending to my own event Healthy Diet-Breakfast guest hosted by Roshni & to Amina's Guest Quest. .
Take the flour,milk powder,confectioner's sugar,chocolate powder and butter in a bowl, meanwhile mix the yeast,sugar and salt in half a cup of luke warm water,keep aside for few minutes until the yeast turns foamy..
Make 6-8 medium sized balls from the dough and arrange them over a baking sheet lined over a baking tray,brush the buns with enough milk,bake for 20-25minutes until the crust turns golden brown..
Today's post is super colourful,delicious beets naan prepared without yeast.I havent prepared naans since a long and i was planning to do them for our yesterday's dinner as i prepared some paneer butter masala to serve along with.There were some leftover cooked beetroot chunks sitting in my fridge since a day,i cant cook them as anything so i thought of using them for making this colourful naan. I just prepared a paste simply with those leftover beets chunks and water, used that beets paste for kneading the dough. This beets naan is simple and quite easy to prepare.To enhance the flavour of this naan i added a tablespoon of caraway seeds, slightly pounded with mortar and pestle to bring out the aroma of caraway seeds.Needless to say this naan turned out more tasty and flavourful.Check out other bloggers running this 16th edition of blogging marathon here.Sending to my own event Healthy Diet-Breakfast guest hosted by Roshni. Pound the caraway seeds coarsely...Sieve maida, baking powder, baking soda together. Take the flour in a bowl, pour the milk, beets paste, salt, pounded caraway seeds and sugar and knead as soft dough..Arrange the dough in a greased bowl and cover it with a towel....keep aside for 2hours in a warm place. After 2 hours knead the dough and make out 6-7 even balls,dust the balls generously and roll the dough as thick oval shape discs..
Heat a thick bottomed tawa, apply water on one side of the naan, drop the watered side to the tawa and cook in simmer with lid closed, once they get cooked,flip the other side and cook well. I couldnt stop myself making some more onion rings,sorry guys if am boring you all once again with some guilt free baked onion rings. This time i went for finely grinded cornmeal,chaat masala and white pepper powder, they came out extremely addictive and quite crispy,delicious and yummy finger food. The addition of chaat masala and white pepper powder gives a fabulous taste to this super crispy onion rings. 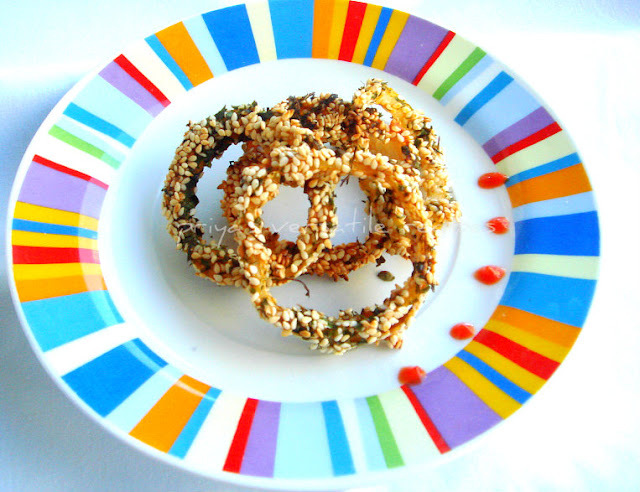 Definitely this recipe is a keeper for me, am gonna try with different spices later.We enjoyed having these oil-less onion rings with sweet chilly sauce for our evening snacks. This is my second entry to From Fried To Favourite started by Nupur of UK Rasoi. Separate the onions as single rings,meanwhile make a thick paste with corn flour and water with salt. 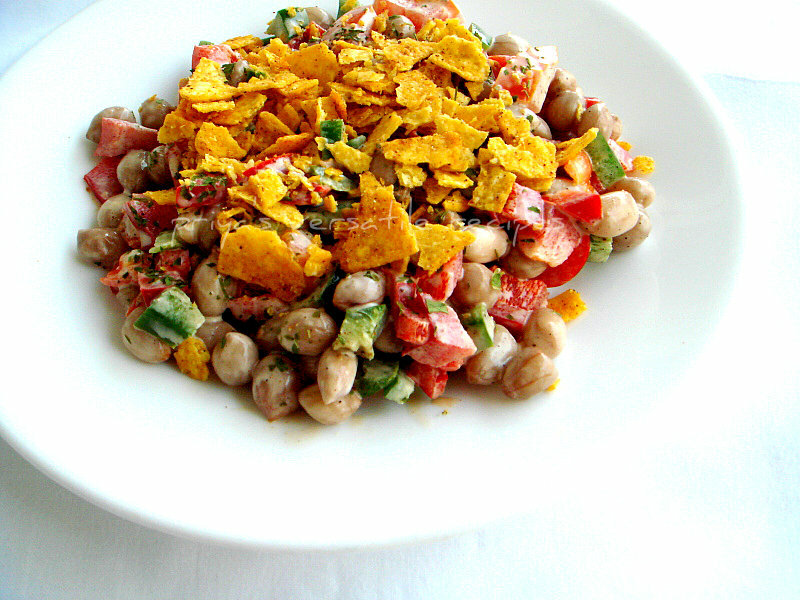 Take the chaat masala,white pepper powder,yellow cornmeal together in a plate. Now gently dip the onion rings in the corn flour paste and drop immediately, roll them over the spiced cornmeal mixture. Preheat the oven to 350F,prepare a baking tray lined with a baking sheet, brush the baking sheet with enough oil, now arrange the already prepared cornmeal coated onions rings and bake for 15-20 minutes. Serve hot with sweet chilly sauce. Most of our dinner goes for quick,simple and healthy salads or soups,but my better half love to have crispy dosas anytime, he can just eat dosas even everyday.Needless to say that i have to prepare dosas quite often for our dinner eventhough sometimes i dont feel like having it.Its been a long i was planning to prepare dosas with tomatoes.When i choosed cooking with colours for this week of blogging marathon,the first natural food colour came immediately to my mind is tomatoes. Its time for me to give a try to tomato dosas as they are in my to do list since a long.I used red tomatoes,tomato ketchup while grinding my dosa batter and these dosas came out super tasty with a beautiful red colour. My teddies just loved it and we enjoyed having this crispy dosas with spicy coconut chutney.This is my 2nd entry for this month's 16th edition of blogging marathon,do check out the other bloggers running this marathon here.Sending to my own event Healthy Diet-Breakfast guest hosted by Roshni. Grind the rice,chopped tomatoes,tomato ketchup,dry red chillies,cumin seeds and salt, as dosa batter by adding enough water. You can either make this batter before making dosas or you can leave them to room temperature before making dosas.. While bloghopping this morning, i came to know about this interesting event called From Fried To Favourite started by Nupur of UK Rasoi, seriously i want immediately to join this group and mailed her.For my surprise,she invited me to join this group of bloggers.The main aim of this challenge is to try deep fried different dishes as either baked or steamed but not as deep fried, who will say no to this incredible challenge definitely not me. This month's challenge goes for baked samosas or onion rings. My love for onion rings pulled me to give a try to this super crispy,yummy,nutty onion rings with dry parsley leaves and sesame seeds.They came out absolutely prefect,super addictive and definitely guilt free.I prepared two trays of this onion rings and everyone at home enjoyed having this onion rings simply with some ketchup.We just loved it. Separate the onions as single rings,meanwhile make a thick paste with corn flour and water with salt. Take the sesame seeds and dry parsley leaves together in a plate. Toss the onions rings with red chilly powder until the onion rings gets well coated. Now gently dip the onion rings in the corn flour paste and drop immediately, roll them over the sesame-dry parsley leaves mixture. Preheat the oven to 350F,prepare a baking tray lined with a baking sheet, brush the baking sheet with enough oil, now arrange the already prepared sesame coated onions rings and bake for 15minutes. I'll be running two weeks of blogging marathon from today onwards, i choosed cooking with colours as theme for the first week of this fantastic event, so this week my dishes will be quite colourful and definitely delicious,check out other bloggers running this 16th edition of blogging marathon here. For the first day of this marvellous blogging marathon, i wanted to post this colourful pumpkin lacha parathas prepared with home made pumpkin puree.These parathas tastes fabulous with minimum efforts and goes for flour,pumpkin puree, warm milk and oil.Lachha parathas are quite easy to prepare and its completely a filling dinner or lunch when served along with a spicy side dish..We enjoyed having this parathas with chicken kurma for our dinner.You can fold this parathas many ways, i went for cutting the rolled dough as long strips and rolling them as like swiss roll.Once cooked, just push the sides of the paratha to release the layers and served them warm.You can conserve them very well for a day or two and serve warm by reheating them in a griddle or microwave oven.Sending to Veggie For A Month-Pumpkin guest hosted by Ruchikacooks,event by Priya and my own event Healthy Diet-Breakfast guest hosted by Roshni. Knead the flour, salt and a tablespoon of oil with warm milk and pumpkin puree, knead well as firm dough. Brush the dough with oil and keep aside for an hour..Divide the dough as equal size portions and roll as circles..
Brush with some oil and sprinkle some flour over the rolled circles..Cut the circles as strips, arrange the strips one by one over themselves and roll tightly as a swiss roll. 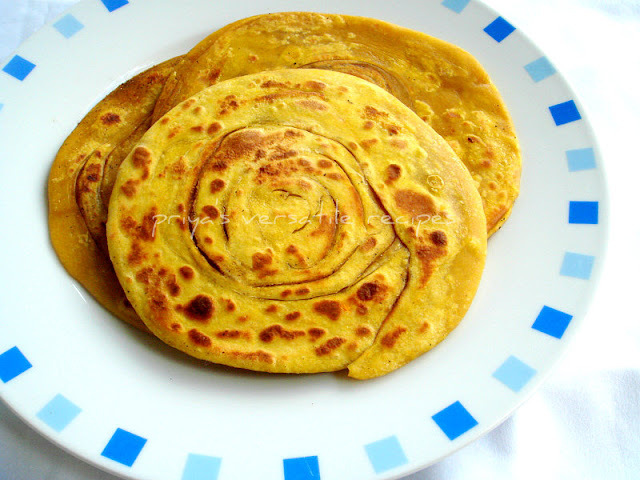 Keep them aside again for an hour..now press lightly with rolling pin to give a round shape..
Heat few drops of oil, cook this rolled paratha on both sides by drizzling enough oil, until they get cooked well, once get cooked just push the sides to release the layers. Serve hot with spicy side dish..
We get fresh yam in Indian grocery very much easily,obviously i never failed to get them whenever i go there.Back home i usually cook them partially with turmeric powder and salt in hot water,once they gets cooled i'll freeze them for further use.So that you can cook up these frozen yam cubes easily as anything, you can make out any kind of dishes with this already cooked frozen yam cubes quickly as they are already ready to cook. Weekend while cleaning my freezer, i got a packet of already cooked yam cubes.Without any hesitation i prepared this quick,spicy,yummy,crispy yam roast flavoured simply with fennel seed powder and spiced with chilly powder,salt and rice flour.This roast tastes simply awesome with curd rice or sambhar rice.Sending to SYF & HWS Series-Fennel seeds guest hosted by Kaveri,event by Anu. 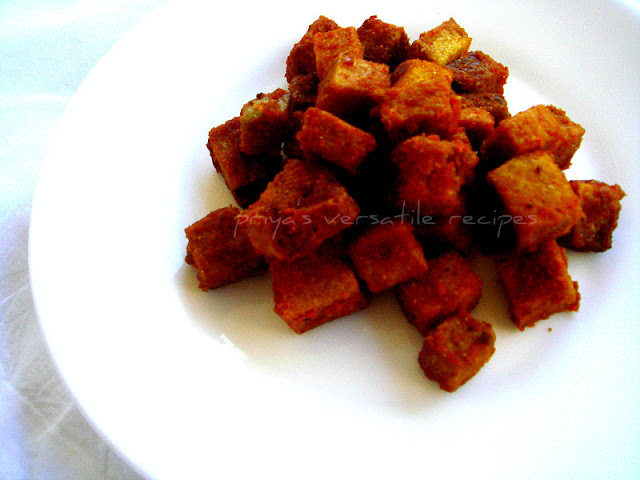 Take the thawed yam cubes in a vessel,add the red chilly powder, fennel seed powder,rice flour and enough salt, mix well until the yam pieces (sprinkle water if needed) gets well coated with the spices. 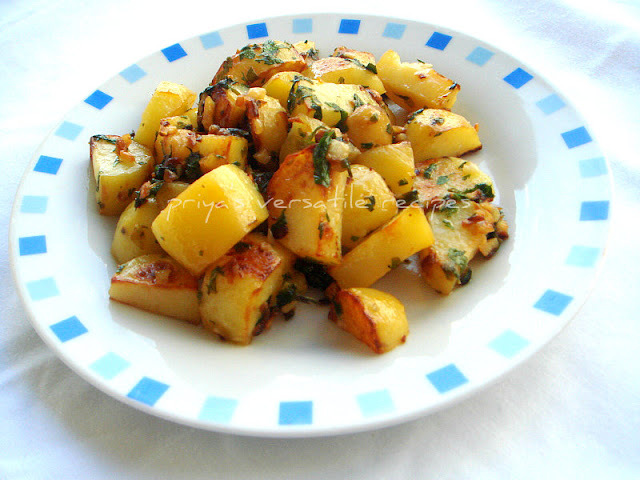 Heat oil for shallow fry, gently sprinkle the spiced yam cubes to the hot oil,fry until they turns crispy on both sides,drain it with a paper towel and serve hot as side dish or as an appetizier. Sunday's lunch goes always for briyanis,pulaos or either flavourful spiced rice dishes, its been a while i prepared my favourite brinji rice for sunday lunch. As i told earlier we invited a Spanish gal for a week of language exchange programme, after having spiceless dishes specially i prepared for her,she was quite curious to taste our spicy Indian dishes. Personally i wanted to prepare something spiceless,but she was quite tempted to have something mildly spicy,so i prepared this mildly spicy,delicious and flavourful brinji rice.Yesterday she leaved to Spain after a week stay in Paris, i served this cashew brinji rice with chicken 65 for sunday lunch, for my surprise she enjoyed thoroughly this brinji rice. Omg, i was bit nervous until she told it wasnt that much spicy for her. 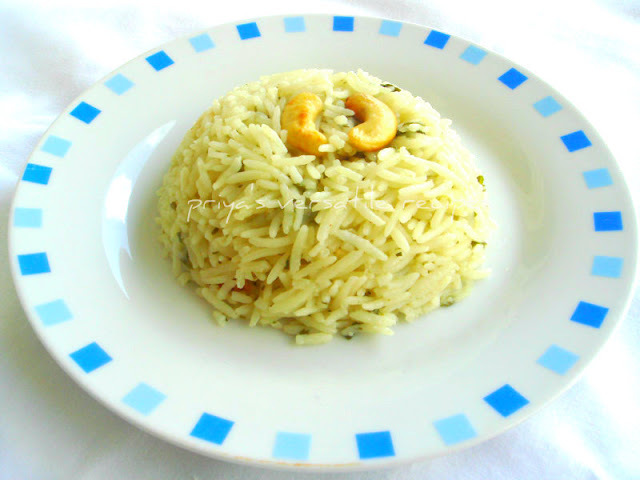 You can prepare brinji rice by adding variety of veggies,soyachunks or simply with any kind of nuts, my choice went for cashew nuts.This rice gets ready easily and its quite spiceless as this whole dish is spiced only with some green chillies. Serve this rice with any kind of spicy side dishes prepared either with meats or veggies, am damn sure your lunch will be definitely filling and satisfying. Sending to SYF & HWS Series-Fennel seeds guest hosted by Kaveri,event by Anu. Heat a pressure cooker with enough ghee or oil, add the whole spices,fennel seeds and fry until they turns brown, now add the sliced onions,ginger garlic paste,slit opened green chillies and salt, cook everything for few minutes until the onions turns transculent. Now add the coconut milk,water,bring everything to boil. Add immediately soaked and drained basmati rice to the boiling coconut milk-water mixture. Add the chopped mint leaves to the rice and close the cooker with the lid,cook upto 3hisses and put off the stove. Meanwhile heat enough ghee or oil,fry the cashews until they turns golden brown.Once the steam get released, add the fried cashews to the rice, toss gently.. Serve hot with your choice of spicy side dish. Crunchy munchy murukkus are always my teddies favourite,i do quite often varieties of these crispy beauties whenever we feel like munching some.My mom passed me a packet of red rice flour few days back, actually i want to make some string hoppers with this red rice flour,since i never tried anything with this red rice flour i went for making out some crispy murukkus.I prepared this murukku blindly without any idea,but finally i was surprised that these murukkus turned out super crispy and quite addictive, we just loved it.If you wanted to experiment with this red rice flour, i'll advice you to try out these yummy crispies..
Take the gram flour,red rice flour,butter, sesame seeds, asafoetida powder and salt in a large bowl, mix everything for a while,now add water to turn them as soft and smooth dough..
Take the murukku press with your choice of nozzle,meanwhile heat the oil for deepfrying,squeeze out directly the murukku dough to the hot oil, fry until the bubbles gets off.Drain the murukkus with paper towel,store them in an air tightened box. Soyabeans are extremely rich in proteins, we do make quite often sabjis and sundals with this healthy legumes..But somehow i didnt tried them in making vadas,few days back i tried making this super crispy vadas by combining both split green peas and soyabeans together.They turned out quite addictive, super crispy,for my surprise both greenpeas and soyabeans together worked out wonder in this vada..Enjoy this vadas for your snacks with spicy coriander chutney or simply with coconut chutney. I deep fried them as am trying this combination for the first time in case if you want to give a low fat version just prepare them by using the appe pan,am damn sure that they will tastes simply prefect as the deep fried ones. Sending to my own event CWS-Soybeans guest hosted by Anu & to SYF & HWS Series-Fennel seeds guest hosted by Kaveri,event by Anu. 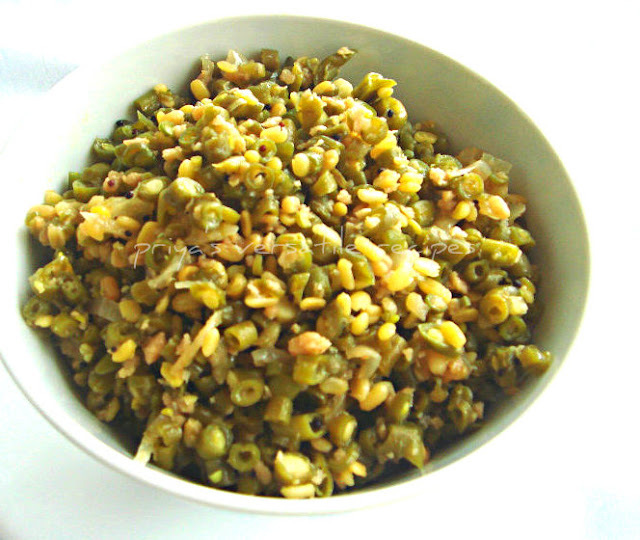 Grind the soaked dry green peas,soaked soyabeans with cloves, cinnamon stick as coarse paste. Add the chopped onions, chopped green chillies, fennel seed powder, chopped ginger, curryleaves, salt and mix everything well..
Heat the oil for deepfrying, take a small golf ball size vada batter and flatten them with ur palms, drop gently to the hot oil and fry until they turns golden brown and crispy, drain the excess of oil with paper towel. 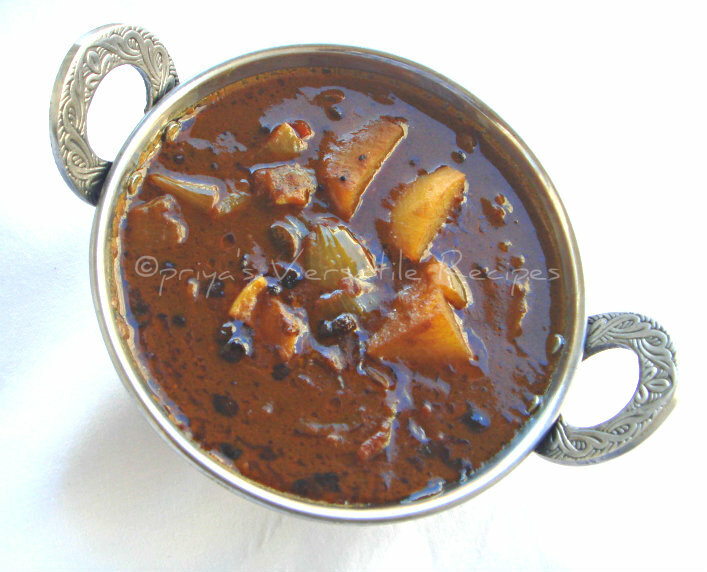 Serve hot with sambar or any spicy chutney.. I dont know much how to prepare focaccia at home before blogging, but blogsphere teached me a lot of things, especially baking and eggless cakes.Thanks to this wonderful world,nothing is impossible here. Most of us know that focaccia is a kind of flat bread quite famous in Itlay. Usually seasoned with olive oil and herbs, topped with onion, cheese and meat, or flavored with a number of vegetables, focaccia suits prefectly with any kind of dishes as accompaniments. 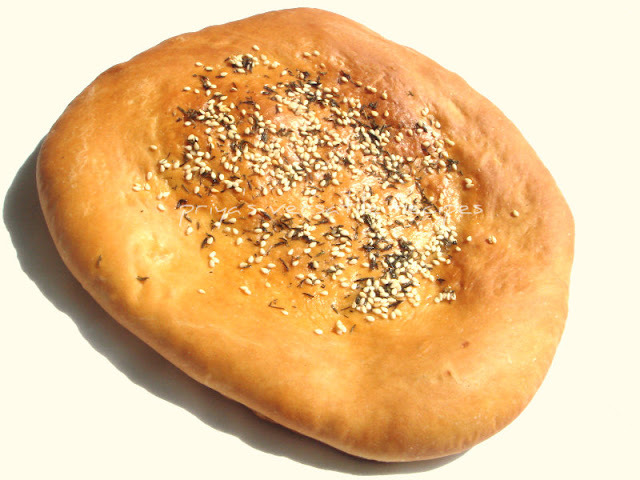 Focaccia doughs are similar in style and texture to pizza doughs consisting of high-gluten flour, oil, water, salt and yeast. It is typically rolled out or pressed by hand into a thick layer of dough and then baked in a stone-bottom or hearth oven.After trying various focaccia, this time i went for a simple,definitely flavourful focaccia with a variety of mixed herbs and fine semolina.Sending to Breaking Bread-Focaccia hosted at Cake Duchess. Mix the sugar, salt and yeast in luke warm water, let them sit for 5 minutes..Take the all purpose flour,semolina in a mixing bowl, add the foaming yeast(add water if needed), one tablespoon of olive oil and mix everything well, its will be stickly at this point. Transfer the them to lightly floured surface and knead for a while until they turn soft dough..Coat a deep bowl with olive oil, place the soft dough, cover it and let it sit for 1 hour in a warm place. After an hour,the dough will almost doubled the size...put the dough in a round baking pan.Apply few drops of oil to the baking pan n press the dough to flatten them or roll it as a flatten round disc.. 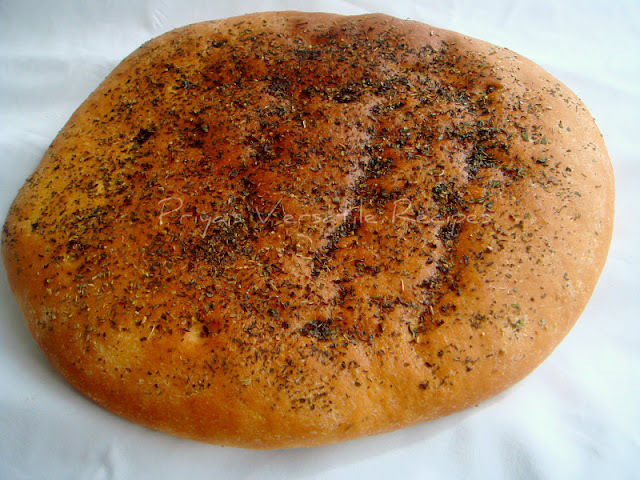 Mix the herbs in olive oil,brush the top of the focaccia well and keep again for half an hour in a warm place..
Am not very much good in writing an intro, whenever i want to write each of my posts i used to break my head to come up with a brief introduction. Few of my blogger buddies write so many marvellous introduction while writing in their space, everytime while going through their spaces i was awestruck to see their way of writing, hope a day i'll write as they do. I can cook up anything with paneer, coz its our family favourite cheese. We simply love it as anything in anything, obviously a packet of paneer gets vanished very much quickly. Sometimes i do have to prepare fresh paneer at home with low fat milk..When Kalyani choosed paneer and mint leaves as magic ingredients for this month's of Magic Mingle, i was really excited to try out dishes with this both ingredients. 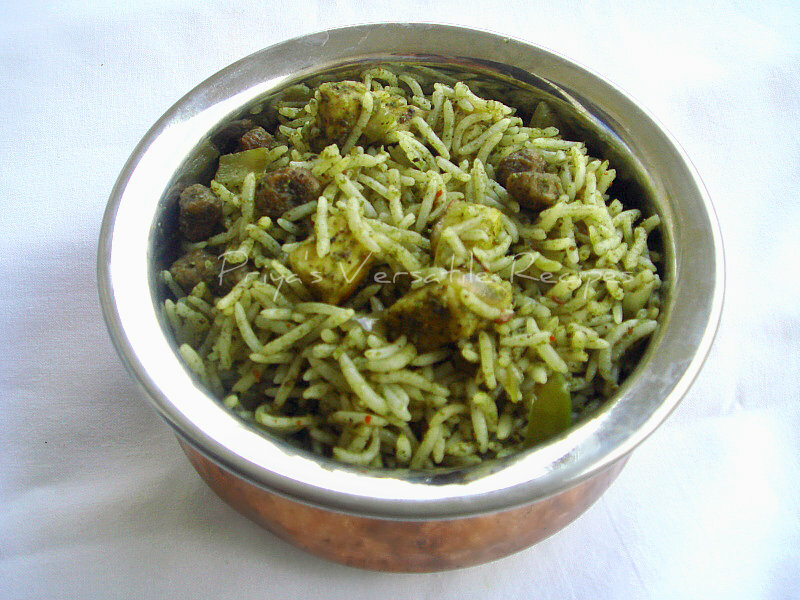 After a long, i prepared this super flavourful pulao in pressure cooker with soyachunks,paneer and freshly prepared mint paste.This pulao tastes absolutely marvellous and definitely flavourful one pot meal.You can serve this pulao as sunday special lunch with your choice of meats or raitas. Grind everything from the list 'To Grind' as fine paste by adding few drops of water and keep aside.Soak the basmati rice for 15minutes in enough water. Heat enough oil in a pressure cooker, add the cumin seeds,bayleaf and let them get fried, add the chopped lengthwise onion,slit opened green chilly,salt and saute for few minutes..
Now add the cooked soyachunks,cubed paneer,saute for few minutes,finally add the grounded paste,cook for few more minutes. Add the yogurt, two cups of water to the cooking spices,bring everything to boil.Now add the soaked basmati rice to pressure cooker,give a stir,close the cooker with the lid and cook upto three hisses. Once the steam gets released, serve hot with raitas of your choice. Last month coz of my surgery, i missed many interesting events. 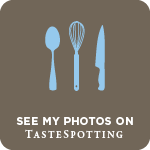 One among those events is Radhika's bloghop wednesdays, i was eagerly waiting to know to whom am gonna be paired this month's event. Finally i got the mail with the name of my pair,i was paired with Charul of Tadka Masala,dunno how i missed this incredible space. Charul have an elegant space with lovely clicks, all her recipes are quite unique in their own way. Thanks to Radhika for pairing me with Charul, while going through her incredible space,immediately her no fry bread pakoras catched my attention and bookmarked it immediately to try them later, but within a week i tried twice as these bread pakoras tastes marvellous and quite easy to prepare. With less ingredients and not deep fried,these pakoras are definitely a guilt free snack to enjoy simply with a spicy chutney or else with tomato ketchup. We just loved it with a cup of tea for our evening snacks. 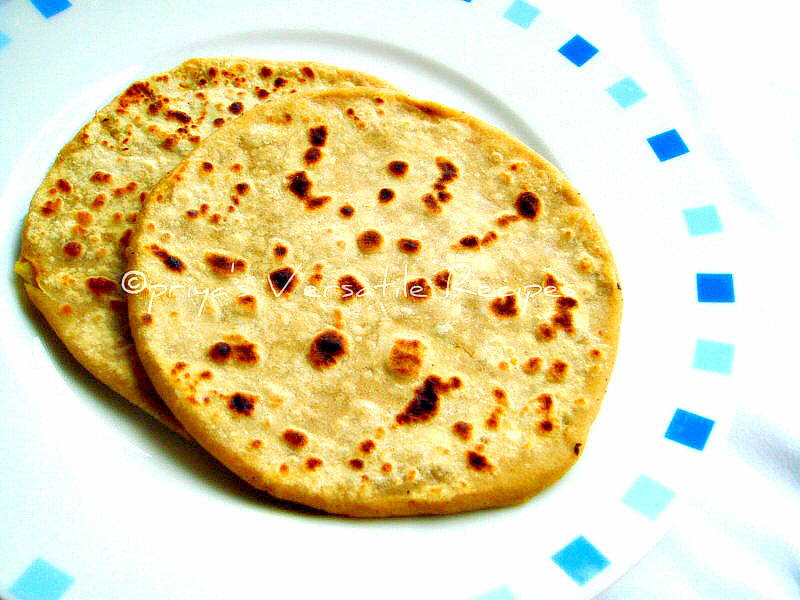 Take the besan flour,garam masala powder, red chilly powder, salt,yogurt in a bowl,add gradually the water to turn as a thin but not too runny paste..
Cut the bread slices diagonally, meanwhile heat enough oil in a tawa,dip the bread slice to the prepared paste and drop gently to the hot oil..fry on both sides until they turns golden brown.. Finally we chosed our President yesterday, we guys were watching the TV continously and was very much happy for our new socialiste President Mr. Hollande. So yesterday i whipped quickly some dishes just to watch out the debats and election results here..Our sunday lunch went for a quick,simple and healthy dishes. Coming to this stir fry, i cooked this yummy,healthy and protein rich stir fry for our sunday's lunch. A prefect side dish for hot piping rasam and curd rice,this stir fry gets ready really in very less time and tastes delicious.Usually i'll add fresh grated coconut to most of my stir fries, for a change i used cooked minced soya granules in this stir fry. An interesting and best way to sneak this healthy soya granules, none will find out this ingredient until you reveal the addition of soya granules. Sending to my own events Healthy Vegetarian Side Dish guest hosted by Vardhini and CWS-Soybeans guest hosted by Anu..
Heat enough oil, let crack the mustard seeds and urad dal..add immediately the chopped onions, slit opened green chillies, curry leaves and salt, sauté until the onions turns transculent..
Now add the chopped beans and soaked moong dal, sauté everything in simmer..Sprinkle some water and close the pan with lid, cook in medium high flame until the veggies get almost cooked, now add the cooked soya granules and cook in high flame until the water gets disappears.. Serve hot as side dish with rice..
We blogger marathoners decided to prepare a virtual bridal shower when we heard that a young,energtic and wonderful foodie blogger gonna marry this month of May..Immediately we went through her space and choosed one of her own recipe, we recreated at our home.Today we (blogger marathoners) revealed wat we cooked from her space for this virtual bridal shower. Wat an incredible way to celebrate her future marriage virtually eventhough many miles separate us physically. Marriage is one of the important,precious and emotional part of life for each and every human,especially for young ladies.. Its a beautiful dream which will comes true the day her lovely future better half tie the knot. Very soon one of our blogger buddy is gonna get married with her love,its Aarthi of Yummy Tummy, while going through some of her post i came to know that both her future husband and herself are in love since a long. My hearty wishes to this young couple.I choosed milk powder barfi from her recipe collections,they came out absolutely yummy, these beauties are quite addictive and we loved it very much. Meanwhile take the sugar in a vessel,cover it with water,bring to boil,cook until it reaches one string constitency, now add the already fried milk powder and cook until the mixture gets off from the bottom of the vessel..
Pour this thickened mixture to a greased plate, springle generously the almond nuts on the top,keep aside until its gets cool..
Cut this barfi as u desire and enjoy. Heart filled wishes on your wedding Aarthi..Happy married life dearie, wishing you both more and more happiness,health,wealth and many more beautiful things throughout your life.. 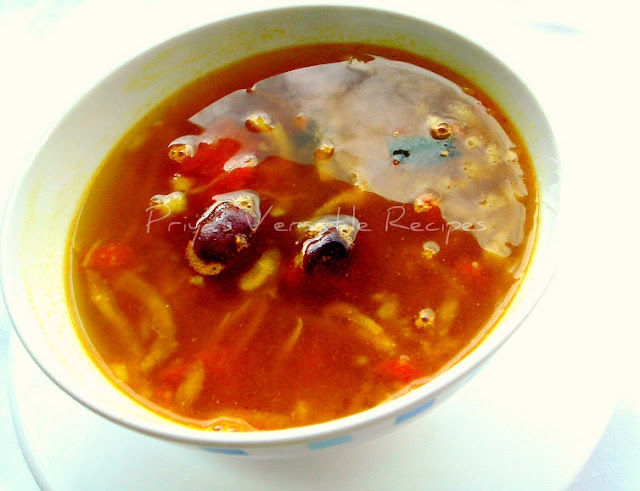 I have hardly seen peoples says no to rasam, its our comforting food. Everyone at home can survive for many days with rasam.We love variety rasams and i have already tried many sorts of this dish with veggies or either with greens. Inspired by Sangee's bottlegourd onion rasam, i tried this rasam yesterday for our lunch.I skipped the onions and used grated bottlegourd for making this rasam,just to feed easily my teddies.Thanks to Sangee for sharing this interesting rasam,we simply loved it..Sending to Ramya's ABC Series-Gourds..
Bring boil a cup of water, cook the grated bottlegourd until it turns soft, add enough water to it,add the crushed tomato,rasam powder,crushed garlic cloves, slit opened green chilly,turmeric powder,,chopped coriander leaves,salt and curry leaves..Mix everything well. Heat enough oil in a vessel, add the mustard seeds,cumin seeds,dry red chillies and asafoetida powder,fry until the dry red chillies turns brown..
Add immediately the already prepared bottlegourd spiced water and bring it to boil,put off immediately the flame.Add the lemon juice and serve hot with rice.. I dont want to say more about soya granules, how healthy they are na. With loads of nutritional values,these soya granules suits prefect to add ton of proteins in your daily diet. Coming to this stuffed soya kheema paratha, its sounds and tastes exactly like the kheema parathas usually prepared with meat based kheemas.As this parathas are stuffed with spiced soya kheema, definitely you can have it for your breakfast or for your dinner with your choice of side dish.This parathas are quite filling,satisfying,packed with proteins,prefect even for dieting, vegan or vegetarian peoples. We loved this vegetarian,protein packed soya kheema paratha very much, i served this parathas with Zucchini Pickle for our dinner yesterday..Sending to my own event CWS-Soybeans guest hosted by Anu..
Heat enough oil in a pan, fry the crushed fennel seeds, add immediately the chopped onions,chopped tomatoes,chopped green chillies and ginger garlic paste,saute until the raw smell goes away..
Add the cooked soya granules,salt,red chilly powder,garam masala powder and coriander powder,cook everything in simmer until the masala turns thick.. Mix all the ingredients for paratha as a soft and smooth dough(add water if needed),keep aside for half an hour..Make 10-12medium sized balls.. Roll the dough as small circle,keep a small ball of the already prepared soya kheema,close the edges of the dough,dust with enough flour and roll the dough as a paratha..
Heat a tawa, drop gently the paratha,drizzle few drops of oil, cook the paratha until they get well cooked on both sides.. Enjoy warm with your choice of side dish..
Summer in India, i truly miss it. Its really a disadvantage for people who lives in abroad to miss those nostalgic summer days in India. Every summer vacations,me and my younger sister never failed to go to our grandma's village to spend our vacation. Every year, we grandkids get together to help our grandma for making her big batches of vathals,pickles,vadagams etc. My grandma makes varieties of vathals,pickles and we never failed to get some big bags of her homemade preserves and pickles when we left her home after a fantastic summer vacations, its was quite like a routine for us every year to come back home with her varieties of vathals to enjoy throughout the year.I dont have words to say how i miss it now. Its spring here,but dont talk about the weather its raining and raining.Am craving for some homemade pickles to get rid of this nasty weather, i wanted to give a trial for a instant version of pickle with some fresh zucchinis, for my surprise its tastes absolutely prefect. Quite similar to those crunchy mango pickles, though this pickle is an instant version, you can make it anytime. This pickle stay prefect for more than two days in room temperature if you conserve them in air tightened box.An excellent side dish for curd rice and rotis.Sending to Kalyani's Pickles & Preserves Fest. 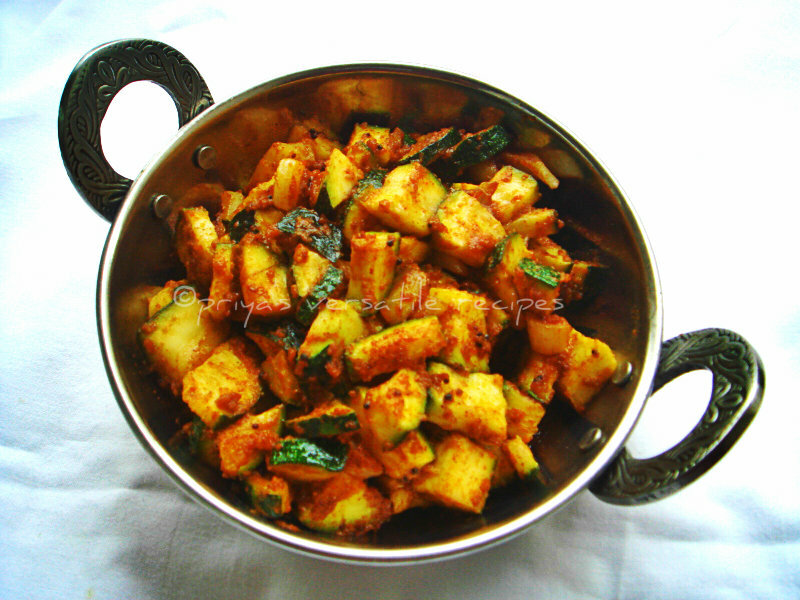 Dry roast the mustard seeds,fenugreek seeds together in a pan, once they gets cooled grind as fine powder..
Take the cubed zucchini pieces in a bowl,add the red chilly powder,amchur powder,grounded mustard-fenugreek powder,salt and mix it with a wooden spoon.. Meanwhile heat enough oil,let splutters the mustard seeds,add immediately the garlic cloves and fry they turn slightly brown, add immediately this tempering to the already prepared zucchinis with spices.. Mix again well and conserve it in an air tightened box. Once a week, its quite an obligation for me to make out some dals based gravies, sometimes i'll go for an easy breezy comforting dals. Yesterday i tried this kootu with greengram,potato and carrots,they turned out simply delicious,nutritious and definitely fingerlicking. Usually i make kootu simply with a masala paste prepared with coconut,green chillies and cumin seeds,this time i prepared a quite different masala paste using some spices along with grated coconut, this kootu turned out super delicious,prefect to serve along with rice,rotis and dosas. Roast and grind all the ingredients given under the list 'to roast & grind' as fine paste with enough water. Meanwhile pressure cook the greengrams and channadal with turmeric powder and enough water upto 3 hisses...keep aside until the steam gets released. Heat enough oil, lets splutters the mustard seeds,urad dal,asafoetida powder, fry the red chillies until brown, now add the onions,curry leaves,slit opened green chillies and saute until the onions turns transculent...Add the chopped carrots and chopped potatoes,cook for few minutes.. Finally add the cooked and mashed dals,already prepared spice paste to the veggies,cook everything for few minutes,put off the stove.. Serve hot with papads along with rice or simply with rotis and dosas..
My freezer will have always frozen greens, i usually buy fresh Indian greens from Indian grocery whenever i'll go there. Back home,i'll clean them immediately and stock them in freezer for further use, unfortunately we dont get variety of greens here. Apart from drumstick leaves,methi leaves and amaranth leaves we dont have any choices of greens, obviously i have no option rather than freezing them. Its been a routine for me to freeze drumstick leaves,so that i can make many dishes using this greens whenever i feel like cooking with this healthy greens. Its been a while i posted non vegetarian dishes in my space, last week i prepared this super spicy chicken curry with drumstick leaves, this dish goes awesome as side dish along with hot piping rasam and sambhar rice..I used a homemade spice powder to spice up this chicken dish, just loved it.Sending to Usha's Chicken Feast. Grind all the spices given under the list 'to grind' as fine powder and keep aside.. Meanwhile heat enough oil in a kadai,fry the whole spices until they turns brown, add the chopped onions,ginger garlic ,curry leaves and cook until the onions turns transculent,add now the chicken pieces,turmeric powder and salt,cook everything again for few minutes..
Now add the already grounded powder,red chilly powder,frozen drumstick leaves to the cooking chicken pieces,sprinkle some water and cook everything simmer until the chicken gets well cooked.. Most of my buddies and followers left comments asking about the new name of my space, yep guys its been a while i want to change the name of my space. Finally i changed it before few days,hope you guys like it. Also am trying to finish my header with some recipe clicks,but its quite a tough task for me.Will get my header soon hopefully,till that please bear with my simple header..
Coming to this kuzhambu, its one of our family favourite, comforting food for us. 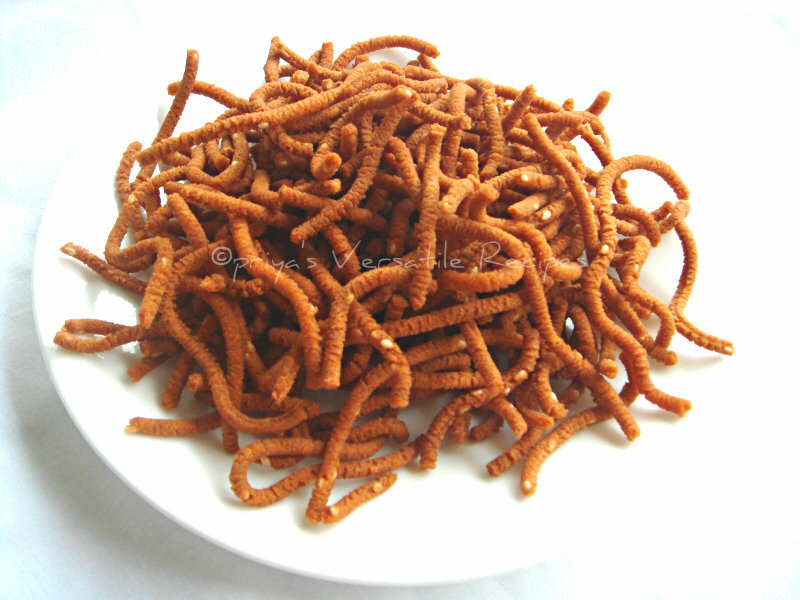 Serve me this kuzhambu with papads,i can have it anytime of the day. Am so crazy of this yummy tangy gravy, my mom passed me some of this dry nightshade berries some days before, while going through my space i was bit shocked to see that my favourite gravy with this dry nightshade berries is missing. Prepared it again yesterday with some potatoes and served everyone at home with hard boiled eggs and fryums..Gingelly oil gives more flavourful to this tangy gravy,you can add brinjals,bhindis to the gravy in case you dont want to add potatoes..Sending to my own event Healthy Vegetarian Side Dish guest hosted by Vardhini..
Heat gingelly oil in a heavy bottomed pan, fry the mustard seeds,fenugreek seeds,ajwain seeds and curry leaves ,now add the dry nightshade berries and garlic cloves and fry until they turns brown, add immediately the diced onions,chopped tomatoes and cook until the onions turns transculent and tomatoes turns mushy..
Add the chilly powder,coriander powder,pepper powder,cumin powder,salt to the tamarind juice and finally add this spiced tamarind juice to the cooking veggies..
Bring everything to boil now add the cubed potatoes, cook everything in simmer until the oil gets separates,the gravy constitency should be bit thick..